Literary travel fiction at its best! Set on Lanzarote, Canary Islands, Spain, The Drago Tree will capture your heart. Haunted by demons past and present, geologist Ann Salter seeks sanctuary on the exotic island of Lanzarote. There she meets charismatic author Richard Parry and indigenous potter Domingo and together they explore the island. Ann’s encounters with the island’s hidden treasures becomes a journey deep inside herself as she struggles to understand who she was, who she is, and who she wants to be. Set against a panoramic backdrop of dramatic island landscapes and Spanish colonial history, The Drago Tree is an intriguing tale of betrayal, conquest and love in all its forms. “Held together with a mouth watering description of the landscape and history of Lanzarote.” James Synot, Goodreads. “Isobel Blackthorn is a writer who has the skill of creating a scene that places you there. This is often something writers struggle with but not Isobel Blackthorn. As a reader I was not only there, I did not want to leave. I was engaged fully, feeling I could touch, see and smell the place and time.” Jennifer Douglas, Goodreads. “If you enjoy reading introspective pieces written in beautiful prose, then The Drago Tree is certainly the book for you.” Overrated Sensibilities. “Loved it…. Great characterisations and descriptive work. Especially liked how Isobel Blackthorn explores Ann’s thoughts and emotions. Also, the mental pictures she conjures up of the Cuevas de Los Verdes are particularly authentic and effective. The device of flicking back and forth from present to past action is subtly and deftly handled, never jarring and always advanced the story without seeming extraneous or overdone. Really, well done! !” – Sandie Johnson. A review taken from Barnes and Noble. The Drago Tree now in Spanish translation! When I began work on The Drago Tree in 2012, all I had were the bones of a short story, a solitary sentence, and a sketch of a protagonist. It wasn’t until I chose the setting that the story started to unfold in me. I’d just finished reading Fay Weldon’s Leader of the Band and I was living through the aftermath of a relationship gone awry. I needed an escape. So did my protagonist, Ann. I was in Melbourne, Australia, but Ann was in the Cotswolds. She is younger than me, and a geologist. Ann takes a trip to Lanzarote, Canary Islands, Spain, where I used to live. And through her I got to re-live that part of my life when I was wild and reckless and free. Ann is anything but. She’s haunted by her past and enchanted by the island landscapes; her thoughts and feelings magnified by her all too recent, all too present, hurt. Tucked away in the solitude of my empty home, with the spirit of Fay Weldon by my side, I spent hours, days and months glued to Google maps and YouTube and hundreds of websites. My ambition was to write the best travel fiction book I was capable of. The Drago Tree turned out to be romance, or perhaps romantic is a better word, in the sense that it is a love story. I became immersed in the island’s unusual geology, rich colonial history and exceptional beauty. It was the perfect escape. By the time I completed the manuscript I felt thoroughly purged. The result is a novel that is a reflection of my own life and yet entirely separate from it. It is a carefully crafted work, written from two perspectives and multi-layered. It was a joy to write. I have written two more novels set in the Canary Islands, one to be released in 2019. If you are reading The Drago Tree while on holiday in Lanzarote then why not explore Lanzarote through Ann Salter’s eyes. 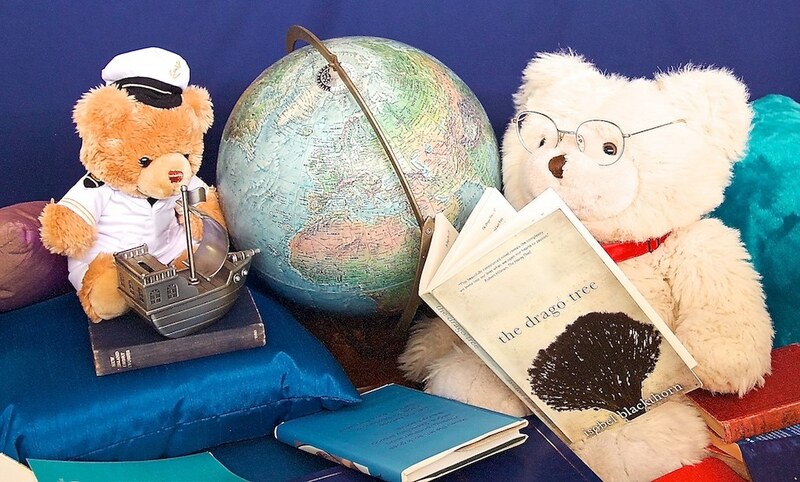 The Drago Tree makes a great travel guide. Journey with Ann from the moment you meet her in the cafe at Jameos del Agua. Travel back on the coast road to Haría and enjoy the haunting scenery. Enjoy the plaza, and the Saturday market. If you are brave enough and have a good head for heights, take a walk down El Risco. If not, go for a drive and check out the spectacular view. Journey back in time to the pirate heyday in Cuevas de los Verdes–not for the claustrophobic–then have lunch in the northern village of Orzola. Head to Teguise for the Sunday markets, and travel down through the fringes of Timanfaya to the extraordinary coastal crater of El Golfo.